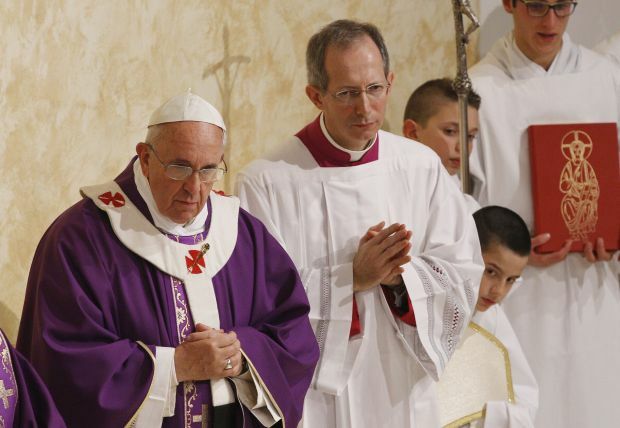 VATICAN CITY (CNS) — In his first message for Lent, Pope Francis called on Christians to follow Jesus courageously as they seek out the poor and sinners, and to make difficult sacrifices in order to help and heal others. Lent begins March 5 for Latin-rite Catholics. Saving the world will not come about “with the right kind of human resources” and token alms, but only “through the poverty of Christ,” who emptied himself of the worldly and made the world rich with God’s love and mercy, Pope Francis said. All Christians are called “to proclaim the liberating news that forgiveness for sins committed is possible, that God is greater than our sinfulness, that he freely loves us at all times and that we were made for communion and eternal life,” Pope Francis wrote. Imitating Christ also includes confronting the abuses, discrimination and violations against human dignity, which often cause the material poverty suffered by those who lack the basic rights to food, water, work, development and “equal access to education and health care,” he said.